The static bike for active and passive exercise. The frame is metallic and the handlebar post is telescopically adjustable. Active – motion solely based on user strength input. Passive – motion solely based on motorized movement output. 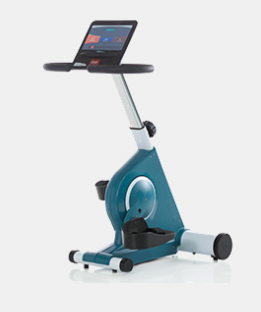 Pedal Assisted – motion based on a combination of user strength input and motor output. It has a console display that lets you input personal data to individualize every training session and provide feedback is shown at the end of each session. The user chooses the durations and the speed of the exercise. The weight of the device is 34 kg.